Amherst College is full of activity as the students arrived on campus this week for the start of the 2018 year and welcomed the newest members the Class of 2022. New to campus this year, our recently completed New Science Center opens its doors to the students and faculty. 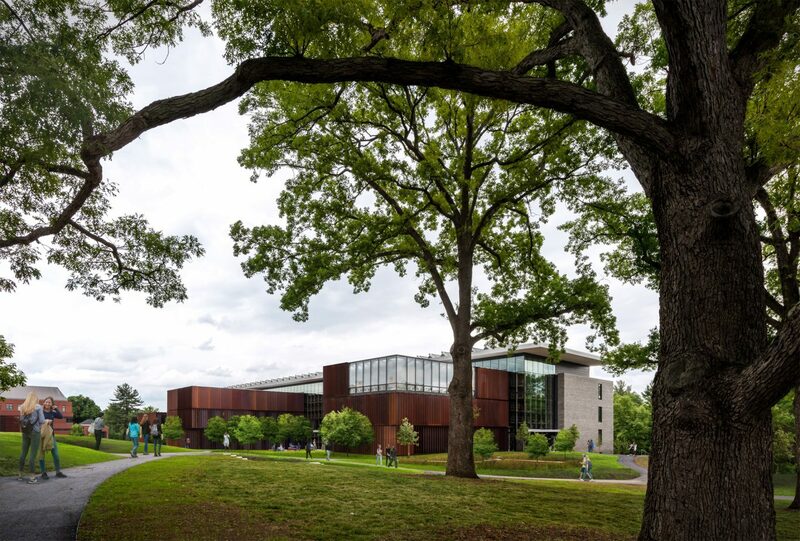 Designed to promote interaction among students in the sciences, across departments and with the campus, the New Science Center at Amherst College creates an open and accessible learning environment for the entire campus community. The program is organized into five building elements, two high energy laboratory wings tucked into the hillside along the east edge of the site and three pavilions of low intensity program set in the landscape to the west, towards campus. The lab wings and pavilions open to a glass enclosed commons promoting a community of science. The commons, transparent and welcoming to the campus, links the sciences to the larger campus community. Earlier this summer, Amherst students had the opportunity to tour the new building. Students and Faculty alike seem excited to spend time in the New Science Center, including Assistant Professor of Biology Katerina Ragkousi. We can’t wait to see the building filled with activity and wish the Amherst College community a wonderful new year!